Dhaka, Bangladesh, 19th of October 2016 — Tech One Global Pvt Ltd continually empowers the local sector with its expertise of providing IT solutions. 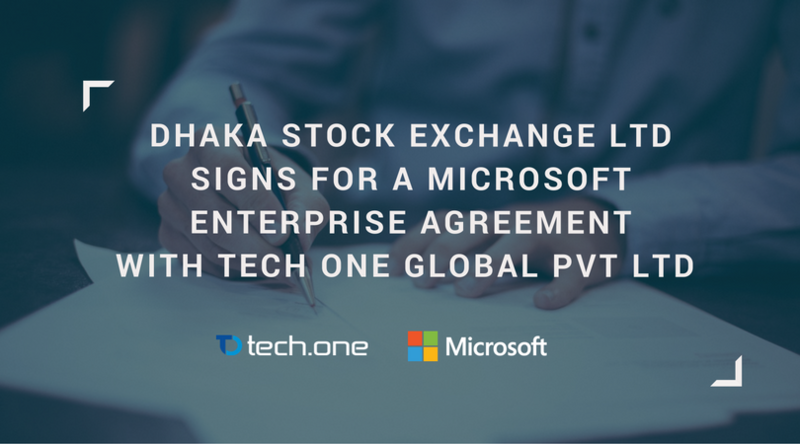 The Dhaka Stock Exchange Ltd (DSE) signs an enterprise agreement with the company, taking Microsoft as the IT platform to be used across its sectors. For years of excellent provisioning of IT solutions all over the country, Tech One Global Pvt Ltd ties a bond with DSE, a registered public limited company, mainly concerned with the country’s stock market. This enterprise agreement declares that DSE has the flexibility to purchase Microsoft licenses to be used in all of its organizational processes. This also aims to help DSE adjust with the rapid changes of technologies in terms of implemented IT solutions. Mr. Wasantha Weerakoone, one of the initiators of this agreement and the Chief Operating Officer of Tech One Global Pvt Ltd said that “Our team at Tech One Global always strives to provide the best solutions to our customers and we are willing to go an extra mile to bring in efficient solutions in order to match Bangladesh’s aim for technological advancement with the help of Microsoft products along with our very own company solutions,” — proving that the company’s expertise equates to selfless customer service and product feasibility. With all the key persons gathered and agreed to this milestone, optimizing organizational processes through Microsoft for yielding positive results is now possible. About Tech One Global Pvt Ltd. Being a forerunner of IT solutions in the country for decades, Tech One Global Pvt Ltd continues to provide its expertise to local and even foreign enterprises. The company sees the possibility for growth on each client they work with. Moved by this passion, the company ensures high-end and consumption-based IT solutions. And as of today, the company continues to improve its tenure in distributing Microsoft licenses and other services, both local and abroad.